Looking for a family day out? The Rare Breeds Centre is a 100 acre visitor farm set in the beautiful countryside of Kent and run by Canterbury Oast Trust. Highlights: Lots of traditional rare breed animals that like meeting visitors, the Exotic Butterfly Tunnel, the Discovery Garden, woodland walks, the Secret Lake, two play parks, a tube maze and indoor soft play barn. There are falconry displays, a restaurant, plants and produce shop. So as you can see there is something for everyone. Visit at Christmas for a truly magical time! Look out for: Our resident volunteers in the Children's barn who will be happy to introduce you to the animals. The exciting pig races in the summer months. The benefits: At the heart of the farm is an inclusive ethos. The farm is run by a committed team comprising staff and volunteers many of whom are adults with learning disabilities who are gaining skills in animal management and customer service. 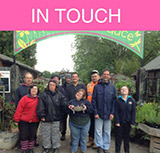 Every time you visit the Rare Breeds Centre not only will you have a great day out but you are supporting the work of COT and enabling the adults we support to live more independent lives. The Enterprise: A shop based at the Rare Breeds Centre selling a great selection of gifts, souvenirs and local produce. Highlights: Rare Breeds sausages made from our own meat or if you prefer an ice cream. The benefits: The shop runs a training scheme enabling adults with learning disabilities to develop skills in retail. As with all areas of our activities any proceeds from our retail operation are used to support the Trust and help people with learning disabilities lead more independent lives. You can find a selection of items in our online shop.